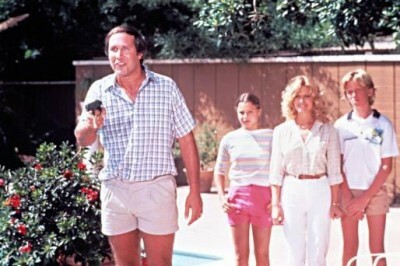 Are you like Clark Griswold in “Vacation?” Do you plan and plan for the next big event? When you go to an amusement park do you plan the route and the times so you can see all the shows and ride all the rides and miss nothing? Maybe you are the person that can’t wait for the weekend or the visit from a loved one. Maybe you look forward to the day when you lose that last few pounds or get that next promotion. Maybe for you it is the expectation that you can buy that new toy or live in a bigger house. Maybe it is a very noble cause like a ministry opportunity, feeding the homeless, divine breakthrough for some issue… On some level we are all planners and dreamers for “the next big thing.” I think some of that is how we are made in God’s image. He is a dreamer and creator. Likewise we have an imagination to see something that doesn’t exist and bring it into reality. We have such a capacity for dreaming and creating, but what happens when this moment, the one right now, is the one you are trying to escape from while you daydream about the next big thing? Is that you? What if our future planning is actually a great distraction? What if our future planning should be God’s future promise instead? Abraham had a promise but was also a planner. When his current moment and foreseeable future did not include a tangible evidence of the promise he took matters into his own hands. God had made him a promise that his family would be huge. Abraham was well past the age of having kids when God promised him a son. I have no doubt that Abraham believed God because of their relationship and trust. God even said that Abraham believed. His belief, his trust in God was the foundation of their awesome relationship. I bet when Sarah finally got pregnant life was easy. The promise was realized in the moment. When Isaac was a boy then life was good. Abraham could dream of a future generational fulfilment of the promise. When Abraham climbed the mountain to sacrifice Isaac he could see past the moment and still be certain of the promise because he trusted God. His faith was complete in that moment and God knew he was ready for the test. Rewind the tape a little and you see something different. Even though Abraham had the promise and believed God he had some issues with the timing. In his present moment Abraham didn’t see any indications that God was doing something regarding the promise. Sarah was still barren and they were both getting older each day. Sarah and Abraham came to the conclusion that the promise of God was true but maybe they were supposed to do something. Instead of resting in the promise and waiting on God, they took matters into their own hands and Abraham had a child with Hagar. The rest of the story is not so good. There are still huge chasms of prejudice and hatred between the offspring of Sarah and Hagar today. The Abraham story is for us. It is easy to look at that story and see it for them and the Israelites but the story of trust and promise is ours today. Let me ask you, can you see God’s promises for you even when you don’t see any indication of the fulfilment of those promises? Do you know what His promises are? Do you at least know what His general promises are? Let me be clear, it is good to dream. That is the exercising of faith. It is good to plan. That is just acting on hope. The harder question is do we trust the creator of dreams? Do we trust Him enough to live in this moment with joy no matter what the circumstance? Would your day look different if you knew what the future holds? Maybe part of our problem is we don’t trust Him enough with the future. Maybe our true joy should be found in trusting Him with the plan. I believe we have to actually expend some effort to stop and smell the roses, take a walk in the grass. Those concepts have become cliché but I bet they contain a divine wisdom. I don’t know why I get so excited about the next adventure. I believe it is healthy. I believe that expectation of good is what God calls hope. Still there is a supernatural opportunity to live in this moment as if this very moment were the moment of promise. We can live in this moment as if we are Abraham on the day of Isaac’s birth. We can climb the mountain and know God has a plan when we get to the top. We can take a deep breath and rest in this moment knowing it could be the best moment of our lives. He made us for this moment. He has prepared us for today. Tomorrow can rest in Him. The joy we think is in the future is one eternal moment from being in the present. Just as I was thinking about this post I read today’s devotional by Joseph Prince. Tell me God isn’t confirming the moment and smiling at our surprise? The verse that set me free was this: “Therefore do not worry about tomorrow…” (Matthew 6:34) You see, if you worry about tomorrow, you are trying to live tomorrow today! My friend, God does not want you to do that. Jesus taught us to pray, “Give us this day our daily bread.” He did not say, “Give us this day our weekly bread.” God gives us daily bread, not weekly bread. God doesn’t give tomorrow’s bread today. And today’s bread is not meant for tomorrow! Beloved, when tomorrow comes, the bread—provision and grace—will be there. I am not advocating laziness and inactivity. By all means, do your homework, but don’t worry about it. Just trust the One who wants you to give Him all your cares (1 Peter 5:7), and enjoy His peace and life today! God’s timing is always perfect. We just need a reminder like this post at just the right moment. The next big thing will happen. We have to trust God that even if we don’t clearly understand His specific promises in our lives we can know that we have them. We can know that He has great plans for His kids. We have to know that no matter what today looks like it is the perfect time for whatever He has planned. We can stop comparing our experience with others. We can stop trying to predict a future will likely be very different from our expectations. We can stop being disappointed in the next big moment that didn’t turn out so great. We can stop trying to force a future that will never be as good as what He has planned. I say we trust God for our next big thing and rest in the assurance that He really wants us to have “the next big thing” every day. It just so happens that some of them will look like Isaacs and some will look like Red Sea crossings and some will look like daily bread. I pray we all find rest in this moment, have divine hope for a future and stop looking for something that we already possess. The ultimate prize in all the universe is Jesus himself. He is in us and He wants us to know that. If you don’t know, if it isn’t your present reality, then tell Him, cry out to Him. Stop, take off your shoes and get your sniffer ready. Smell the roses and feel the grass between your toes. God intends for us to experience eternal life right now. This is the moment you have been waiting for. Let him show you.